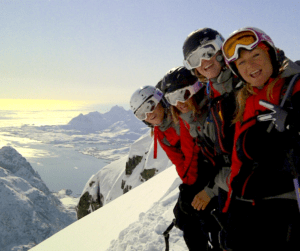 Check out her Epic Moments Camp for experienced skiers. If you are organizing a ski trip for your organization you can also hire Anja to come along and add some unique content. Get Anja’s input. Anja has more than 20 years of media experience – first as a world class athlete and since as a regular freelance contributor in various forms: Writing for magazines and newspapers, co-hosted a mini-series with skiing tips for Danish TV, producing her own videos, co-authored a book, done a TEDx-talk, been Olympic commentator and expert, appeared on various shows, worked as Social Media Producer and Copywriter for the Freeride World Tour. Feel free to reach out.